I believe I was about seven years old when my daddy bought a car. It was a red, Plymouth convertible. I don’t know what year, probably early 1940’s. I never quite understood why he bought a car. Neither he nor my Mother knew how to drive, but I sure was glad he bought the car. That was the most beautiful car in the world! It was one of the most exciting times of my childhood. I wanted to learn how to drive more than anything. I would picture myself driving that car. Of course, the first thing they told me was to stay out of the car. “Don’t mess with the car.” “The car is not a toy.” Boy, were they ever wrong! It was the best toy I ever had! I knew I was destined to get into trouble with the car, but I didn’t care. I would be willing to endure whatever punishment they gave me if I could just get my hands on that steering wheel. I started making plans right away. I knew I had to do it when no one was home. That was hard because with all the people living in our house, someone was always there. I knew the keys were hanging in the kitchen cabinet, so that was not a problem. I would sit on the front porch and just look at it. I would walk out to the driveway and rub my hands on it. Then, I’d open the door and just look at the seats and the driving pedals on the floor. My sister Ola had a car, and I would watch how she operated the pedals. I would ask her questions like “What is that pedal for?” I finally knew that the pedal on the right side was the brake to stop the car. The one on the left was called the clutch. That was to change gears. Then, to the right of the brake was the gas pedal. That made the car go. The handle on the steering wheel was the gear shift. It looked a little complicated, but I was sure I could do it if I set my mind to it. There was no doubt about it; I was going to drive that car, one way, or another. First, I would just sit in the driver’s seat. I was checking out everything to see what was what and how everything worked. It was really hard for me to reach the pedals. The brake was not so bad, but the clutch was hard to push while shifting gears at the same time. I started to practice with the clutch, trying to find where all the gears were. I had watched my sister Ola drive when I was in the car with her. I even started asking her questions about where the gears were, what they were called, and how many gears there were. She explained to me that there were four gears. The first one was low gear, then second, then high. Then there was reverse in case the driver wanted to back up. I would watch her, and I thought I had the order of the gears figured out. I watched how she shifted to low gear then pushed the clutch in and went to second gear, clutch in and shift to third. Oh, boy, another promise I would have to break. I sure wished people would stop making me make promises I could not keep. It was getting ridiculous. They knew me, and knew how I was, so why did they make me promise when they knew I could not keep some of them? Some I could keep, but for sure not the car and learning how to drive promise. Finally, the day came when only Junior was home, so I sneaked into the kitchen and got the keys. I went out and opened the driver’s side door. I got into the seat and just sat there for a minute. I put the key in the ignition. I turned the key to start the car, and when I did, the car lunged forward but did not start. I didn’t know it had to be in neutral or have the clutch in for the car to start. This was not good. It meant I had to ask more questions. I put the keys away and decided to wait until I saw Ola again. I saw her the next day because she came by almost every day. She showed me what to do to start the car and how to shift when driving. She should have known better than to give me all that information about driving. I think she knew what I was up to, so she told me the right way to do it so that I wouldn’t mess up the car. Ola was always the sister I could count on. I would lie, and she would swear to it. I heard her, but I was determined to drive that car. As the weeks went by, I was doing pretty well. I could back up in the driveway and then pull forward. It was hard for me to shift because my legs were too short, but I just scooted down in the seat. Finally, I could do it. At first, I was grinding the gears, but I figured out how to not do that. I was thinking I might be good enough to drive to the corner. Thank God we lived on a dirt road with hardly any traffic. My daddy was working with his best friend Johnny Trueblood. He was a full-blooded Cherokee Indian. My daddy was about one-half Cherokee. He was very proud of his Indian heritage, and so was I. They would get drunk on beer, and they would sing Indian chants. I helped them. My mother would get mad and tell us to stop it. We would all three sit at the kitchen table and eat sardines, crackers, and cottage cheese and sing Indian chants like they do in the movies. Hi-ya, hi-ya ,hi-ya. I loved it, and I loved Johnny Trueblood. He was always nice to me and brought me presents. He and my daddy would give me money for ice cream. Now, who could ask for more than that? Well, one day I decided it was time for me to drive to the corner. I got the keys and climbed into the car. I started her up and pushed the clutch in for reverse. I started to back up slowly. I did like Ola did and turned the wheel a little. I pulled out in the road and got ready to shift into low gear to go forward. I was so short that no one could see me too well from outside the car. I really was not nervous or scared though. I knew I was going to do drive that car one day, and I had practiced a long time. I was just wondering how I would turn around at the corner. Not to worry, I could figure that out. I put it in low gear and started to move forward. I shifted into second gear, and I was doing pretty well. I was about half way down the block when I heard someone yelling. “My car is running away!” It was my daddy’s voice. Then, I heard Johnny hollering. I tried to raise myself up as high as I could to look out the window. They were chasing me down the road trying to catch the car. I was going real slow, so they caught me pretty easily. I stepped on the clutch and the brake and put the car in neutral. I was thinking about how much trouble I was in. I was surely getting a spanking from my mother. There would probably be no movies on Saturday either. Daddy and Johnny ran up to the window and saw me in there. They both started laughing, so I started laughing, too. They had been drinking beer. That was why they were laughing. Johnny told me to turn the key off, so I did. He got in the car, drove it back to the driveway, and parked it. My daddy had this big smile on his face. My mother was not there, and my daddy never told her what I did. I was so glad. He knew she would really spank me hard, and he did not like me to get spankings. My daddy never ever spanked me. He did make me promise I would never do that again. I promised, and I did not break that promise because it was made to my daddy. Johnny made me promise, too. He told me that as an Indian I had to keep my word. I said that I would. Then, they gave me ten cents to go get an ice cream cone at the drug store. My mother never heard this story until I was grown when I told her. She got mad even after all that time. 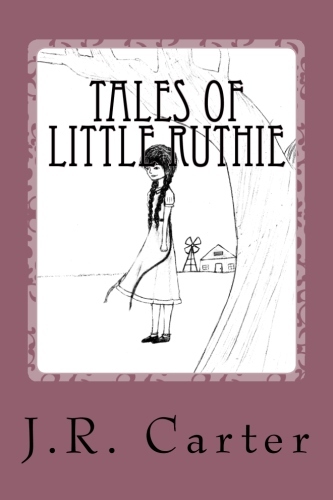 I just thought it was another day in the life of Little Ruthie.